Donald Trump’s policy of pressuring European countries on issues like defense spending, Russia cooperation or trade will ultimately end NATO, Willy Wimmer, Germany’s former State Secretary for Defense, said. 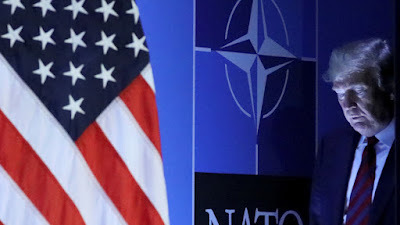 Commenting on the outcome of this week’s NATO summit in Brussels, during which the US president criticized European members of the alliance of spending too little on defense and berated Germany for buying natural gas from Russia, Wimmer said Trump was going too far. “If any Western European government would follow these ideas of Washington, they would be kicked out of office by their own population,” he predicted. “The only response to the US approach would be an end of NATO,” he warned, adding that such an outcome is not what European governments want. Wimmer said the alliance has been losing popularity among Europeans, especially in the past few years when US military adventures triggered a chain of events that was really hurtful for Europe. “If NATO continues its policies, it would lose all the support it had in the past,” he said. “Western European population is no longer willing to support Anglo-Saxon wars in our neighborhood. When we look at the migration crisis in Western Europe, it is directly linked to NATO wars in Afghanistan and Mali. “NATO became outdated the moment we adopted the Charter of Paris in November 1990. No longer war in Europe. And NATO brought war back to Europe,” Wimmer added.